In July of 2016, Maya was awarded 2nd Place at the 4th Stradivarius International Violin Competition! In 2015, she received top prizes at both the triennial Johansen International Competition for Young String Players and the 2015 Cooper International Violin Competition. Bravo! Maya Buchanan performs on Show 327 at the Aspen Music Festival and School on August 14, 2016. 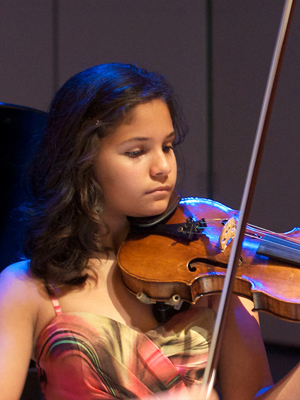 Violinist Maya Buchanan, 15, is from Rapid City, South Dakota and is homeschooled. She is currently studying with Almita Vamos at the Music Institute of Chicago. Maya has been a top prize winner at the Cooper International Violin Competition and Johanssen International Competition for Young String Players and was the second-prize winner of this year’s Stradivarius International Violin Competition. Maya appeared on From the Top as a soloist on Show 276 in Vermillion, South Dakota, at the age of 13. During her free time, Maya likes to do ranch activities such as collecting chicken eggs.